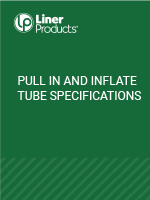 Liner Products CIPP Tubes Meet Wide-ranging Performance Demands For Liner Size, Installation Technique, and Pipe and Site Conditions. Our current technical resource library is below. Please check back often as we work to update this page with technical resources to help design your next pipe rehabilitation project. Contact our product support line or contact us here. 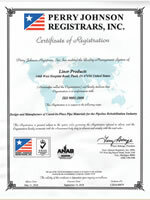 Learn how Liner Products has remained an industry leading CIPP tube manufacturer for nearly 20 years. Polyester felt CIPP lining tubes are generally manufactured from one or more needled polyester felt layers constructed together to form a tube. Each tube is specifically made to diameter, thickness, and length per the customer’s specifications. Liner Products custom manufactures tubes ranging from 3” to 120” in diameter, with thicknesses available in increments of 0.5 mm up to 85 mm. The attached document identifies our standard lot sizes for quick reference and ordering. Liner Products CIPP liners are composed of polyester fiber identified by MSDS Number 2000. 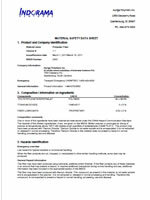 Liner Products’ manufacturing facility is certified ISO 9001:2015. Inversion tubes are saturated with resin and inverted into place inside the host pipe. The resin is then cured to produce the finished cured-in-place pipe. The pull-in-place tube is saturated with resin and pulled inside the host pipe. The calibration hose is inverted inside the resin saturated tube to inflate the tube system against the host pipe. 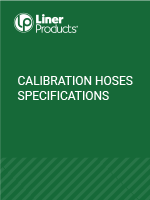 A calibration hose is used for pull-in-place installations to inflate the resin saturated tube before and during the curing process. Small diameter lateral lining tubes are often constructed with specialized materials to enhance flexibility and performance for differing installation equipment and techniques. 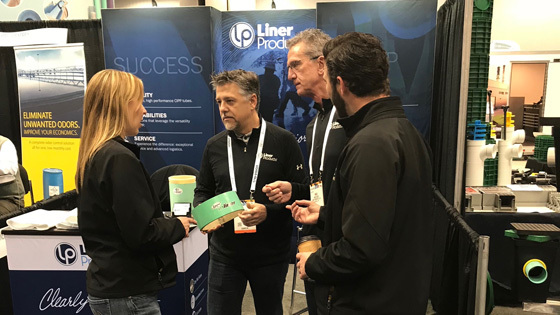 Liner Products reps Justin Hardesty and Mike Green talk to customers about our new line of saturated liners at the WWETT Show in Indianapolis, February 2018. Learn why Liner Products is a Clearly Superior choice for any CIPP lining project.